If you hear the words 'hormonal acne' and cringe in anticipation of your dot leading to, well, dots across your face, you're not alone. And if you thought that acne connected to fluctuations in your hormone levels was a thing of your teenage past, think again. According to the American Academy of Dermatology, an estimated 50 per cent of women aged 20-29 struggle with this form of acne, which is concentrated around the bottom half of your face (think cheeks and jawline area). And although there can be other contributing factors to adult acne (25 per cent of women aged 40-49 deal with their own brand of hormonal-imbalance spots), for today's purposes I'm going to focus on the kind I know all too well— the menstruation-related sort. Now in my experience, maintaining clean, hydrated skin is a good first line of defence against monthly breakouts. This form of spotting is inevitable for me, but I'll be damned if I let clogged pores be the source of additional spots— uh uh honey. I've shared lots of detailed tips over the years for dealing with acne (like 5 Tips for Clearer Skin and 5 Ways to Keep Your Skin Clear), but for today's post I wanted to focus on three key steps to minimizing these kinds of breakouts, as well as share three corresponding products that I can't get enough of. We all know the importance of a good daily cleanser, regular exfoliation and proper nutrition/water-intake at this point, so let's just dive into these products instead, including a new discovery that's been a total game-changer for me. Here goes. Giving your skin routine deep cleans— especially around your time-of-the-month— can go a long way toward avoiding unnecessary spots. Whenever I feel a breakout coming on, I like to lather Origins Activated Charcoal Exfoliating Cleansing Powder all over my face. This water-activated product can be left on the skin as a mask (which usually helps me stop breakouts before they occur), but you can also use it as a daily cleanser to help improve the look and texture of your skin. Oh, and did I mention that this product can help minimize the appearance of pores? Yeah, it does that. That's because it's formulated with super-absorbing bamboo charcoal to deep clean pores and remove any trace of dirt, debris and toxins. And as an added bonus, it makes your skin feel unbelievably soft and smooth to the touch afterward. If you can get your hands on a bottle, I would definitely recommend it. 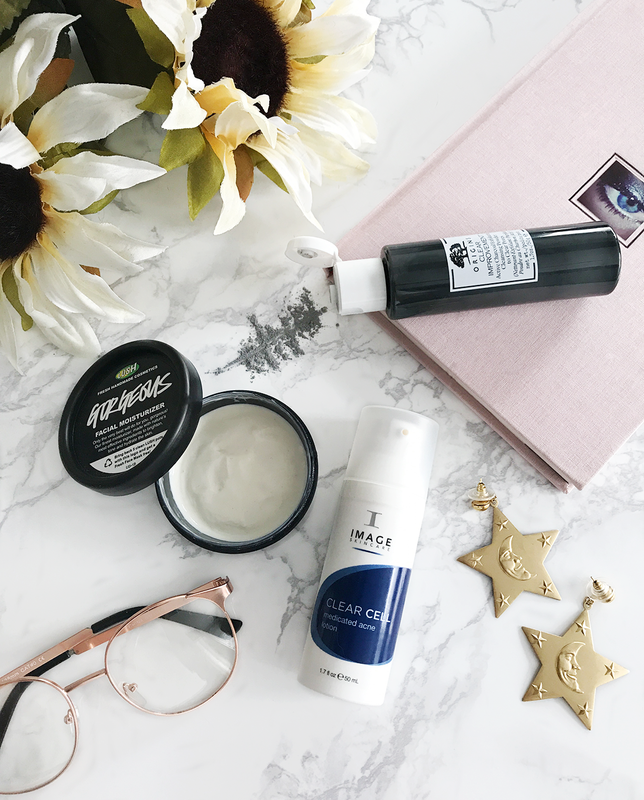 Spot treating is a given when dealing with breakouts, so let's jump into my aforementioned game-changing discovery in this department— the Clear Cell Medicated Acne Lotion from Image. It's hands down the best spot treatment I've ever used, and believe me when I say I've tried my fair share of spot treatments. I was only recently introduced to this medical-grade skincare range (more on that later), but so far I'm head over heels for the entire range. I love this product in particular for zapping blemishes as they arise, and because it's formulated with 5% benzoyl peroxide, my spots are usually gone within a day or two. If you're dealing with more than just the odd hormonal breakout, this product can also be applied daily as an all-over lotion to kill acne-causing bacteria and reduce the overproduction of sebum, so it's a great one for anyone to keep in their beauty stash. Lastly, I find it really important to hydrate and nourish my skin after treating it for breakouts, so I always finish things off with a gentle moisturizer that won't clog my pores. Lush has several great options for this, but their Gorgeous Facial Moisturizer is by far my favourite, and definitely lives up to its name. That's because this one is packed with orange blossom honey, extra virgin olive and wheatgerm oils, and other awesome, organic ingredients to leave skin soft, hydrated, and just plain happy. But be warned— a little goes a long way with this one, so don't be too heavy-handed with its application or you'll end up wasting product. And considering how truly lovely this one is, that would be a real shame.